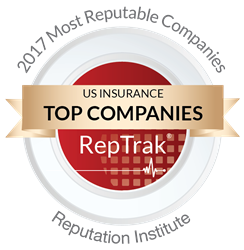 CUNA Mutual Group has been recognized as one of the most reputable insurance companies in the United States, by Reputation Institute, with the release of the 2017 US Insurance RepTrak®, the survey of insurance company reputations. CUNA Mutual Group ranked second overall for most reputable insurance companies and No. 1 in the life and investment category. Reputation Institute’s 2017 survey of insurance company reputations, scores, and rankings are based on more than ratings collected via an online questionnaire. They measure the general public’s perception of where companies stand on seven key rational dimensions of reputation: citizenship, governance, innovation, leadership, performance, products and services and workplace. CUNA Mutual Group ranked high in all seven categories. The survey measures the U.S. public’s perceptions of 44 major insurance companies’ brands. Reputation scores were based on 4,820 ratings drawn from the informed general public, with only people who were familiar with insurance organizations being qualified to answer. The full list of the most reputable insurance companies in the U.S., including breakdowns of how insurance companies performed within sub-sectors, can be found online at: http://www.reputationinstitute.com/US-Insurance-RepTrak. Reputation Institute’s RepTrak® methodology is the gold standard in the science of reputation. Reputation Institute helps global companies unlock the power of their reputations for competitive advantage. Reputation Institute has conducted research over the last 20 years on 7,000 companies across 40 countries developing the largest global normative database in the world on reputation management, KPI’s, benchmarks, metrics and best practices. CUNA Mutual Group helps people plan, protect and invest for their future – regardless of their financial standing. The company was founded more than 80 years ago by credit union leaders who were looking for an insurance and investment partner they could trust. Today, CUNA Mutual Group helps credit unions and hardworking Americans build financial security through commercial and personal insurance products; lending and payment security solutions; and risk management, retirement, investment and marketing services. Additional information about the company can be found at http://www.cunamutual.com.